DIY is one of the most searched terms on the web. We can understand that since there are so many creative things that you can do on your own whether it’s creating a Halloween outfit, decorating birthday cakes, or adding new additions to your home. They can certainly be inspiring. Which is of course why as we watch it, we want to get started right away. They all make it look quick, seamless, and somewhat easy. Well, if something looks too good to be true, unfortunately, and realistically, it normally is. While some of these may be great ideas, others can turn out to be a total fail. Remember, videos are edited. Often times those DIY tutorials don’t show you the behind the scenes nitty-gritty of what all you might run into as you tackle a project. Youtube tutorials are designed to be simple so you can follow along, but we know real life doesn’t always pan out like that. Notice, you never see them consulting a professional on what they might encounter as they do so. Take our advice and consult with someone beforehand to avoid getting in over your head. Along with the aspect of practicality, another thing they don’t mention is the timeline you’re looking at. Sure, for the experienced DIY veteran who has time and money to spend should be fine, but for the everyday homeowner, both luxuries may not be as accessible. Find someone who does this as their full-time job who will have all the time to devote to your project when you run out. Additionally, they don’t include a reasonable budget. Since everyone’s project may be different, you should consider the potential roadblocks that may incur additional expenses. It’s always best to ask a professional first so you can have a budget in mind before you get started. Professionals will know more about the project you’re thinking about starting more than you might. They will be able to foresee the potential problems that you may encounter as you embark on your renovation. DIYers want their videos to look easy so you feel as if you can accomplish them, but the real truth behind the other side of the camera is that it is not always the case. They’re designed to look easy! Real life, unfortunately, isn’t always that simple. And, there’s no blooper reel showing you what all they went through to make this look as simple as they’re trying to tell you it is. Be sure to get that behind-the-scenes look before you purchase tickets to the show. Have a contractor give you a preview of what might potentially come about as you prepare to take on such a project with your home through a consultation. That’s a gamble you shouldn’t take. Plus, they’ll be able to address individual case by case safety concerns. That’s a huge concern to consider because safety should be your priority! Again, DIY videos don’t answer all the questions you may have or those that may arise as you go through the process. Consult with a trusted professional first. Sure, DIY success stories are inspiring, no doubt. But unfortunately, they aren’t as easy as we’d like to think them to be. 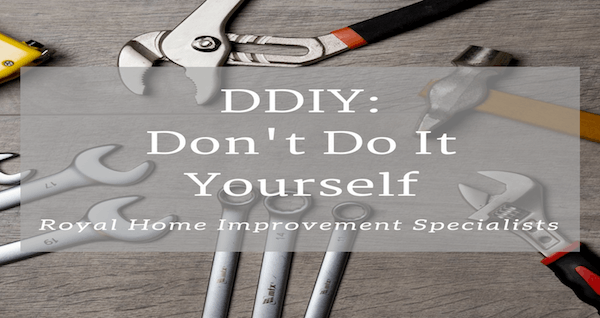 So, in short, have fun with simple DIY’s but when it comes to a complete overhaul, contact a professional to ensure the job is done right the first time. And, in the meantime, get inspired by your home renovation television shows and then let us do the job for you. Be sure to check back next week as share some of the cringiest DIY fails!